You should start with the Thrawn Trilogy. 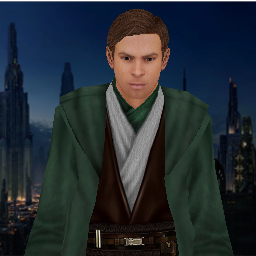 And let's not forget about the saga of Kyle Katarn, the Jedi Knight Games. Already Read Thawn. Although I was about 12, so Might give the comics a go, what about all this, Leia and Han's Kids stuff? I get very lost in the legacy era, I love the Fel empire, but I gt utterly confused with what the time-lines are. ARC1778 wrote: Already Read Thawn. Although I was about 12, so Might give the comics a go, what about all this, Leia and Han's Kids stuff? Leia and Han have 3 kids: Jaina, Jacen, and Anakin. You'll want to look at stuff around the New Republic Era, centering around the Yuuzhan Vong war and those events. But yah, what's the conrology for that sort of thing? This has all novels/comics/other in chronological order. The majority of the New Republic focuses on Luke, Leia, Han, and the original crew, whereas the New Jedi Order begins the next generation. The Legacy Era starts with major events surrounding Jacen Solo, then, after a large time gap, the Star Wars: Legacy comics begin. When he turns to the darkside? TBH I always thought that would be Anakin from the little I read. Any recommendations one what's worth experiencing, and what's best just reading Wookiepedia for? ARC1778 wrote: Any recommendations one what's worth experiencing, and what's best just reading Wookiepedia for? I would highly advice you read the graphic novel for the Thrawn Trilogy. It really defined the Star Wars EU, and with the excellent visuals it's even more spectacular.